While current rumors are suggesting that Apple might be shifting away from the Notch design seen on the iPhone X in 2019, many Android smartphone OEMs have demonstrated interest on the iPhone X Notch Design lately. Apart from the fact that many Chinese OEMs have already announced Android smartphones boosting Notch design, popular smartphone makers like Asus, Vivo, Huawei etc, already have smartphones with notch design under their product lines. And now, OnePlus have been tipped to follow suit with their upcoming OnePlus 6 smartphone. The images/Renders below are believed to belong to OnePlus 6 smartphone, alongside it Antutu Benchmark scores. As you can see in the image above, the front of the OnePlus 6 looks similar to Apple iPhone X. However, OnePlus decided to go for a 19:9 aspect ratio instead of the 21:9 aspect ratio seen on the iPhone X. The notch is home to a very small earpiece and a camera sensor. We are not surprised though. Everyone in China seems to have caught the notch-display bug. While other manufacturers are announcing new flagships at MWC 2018, OnePlus won’t be doing so. The Chinese manufacturer won’t launch a new phone till the second half of the year but that isn’t to say work has not begun yet. 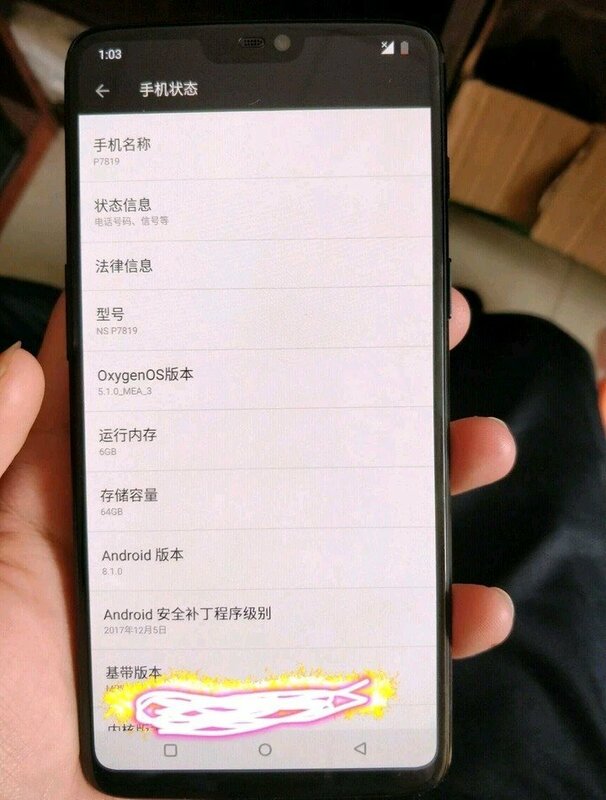 It appears work has actually gone very far as images said to be of the OnePlus 6 or OnePlus 7 have surfaced online. 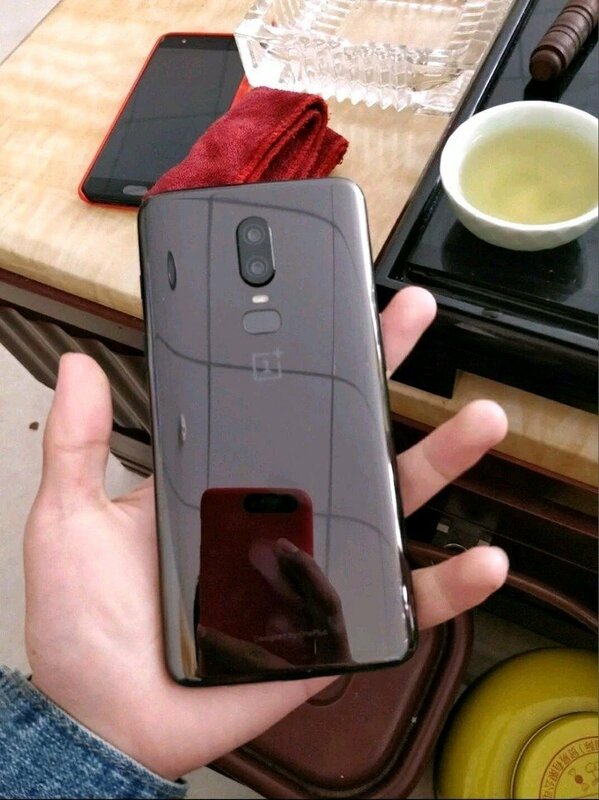 We are not really sure about the name yet but at least we can tell its a OnePlus from the logo at the back. In a statement last year, OnePlus CEO Pete Lau had claimed that OnePlus currently have no interest to incorporate wireless charging facilities into it smartphones yet, as a result, the OnePlus 5T featured a premium brushed metal built. But from the pictures above, that might be changing soon, as the new OnePlus 6 render is featured what looks like a shining glass back panel, which hint at a wireless charging feature being present on the device. Apart from the glass back, the OnePlus 6 rocks a dual camera setup that protruds slightly, but positioned in the middle of the device. There is a LED flash below it and an elliptical fingerprint scanner right after. The device which is device labelled as OnePlus A6000 appeared on the benchmarking platform. Since A5000 and A5010 are respective model numbers of OnePlus 5 and OnePlus 5T, it is very easy to believe that the A6000 is the forthcoming OnePlus 6 flagship. It has recorded an average benchmarking score of 276,510 which is slightly higher than Xiaomi upcoming Mi Mix 2S. Like the Xiaomi flagship, the OnePlus 6 is also rumored to be powered by the highly potent Snapdragon 845 chipset, which currently, is the only smartphone processor capable of such scores in Antutu. The smartphone is believed to go official around May/2018 with a very competitive pricing as seen on previous OnePlus smartphones.